You can always count on Russian fans! After last year’s bootleg recordings of Moscow and St. Peteresburg, here are another two videos covering almost whole Moscow concert that took place on December 1, 2011. Oh yea! St Petersburg was just as expected!!!! Brilliant crowd and the Rox Machine is still going strong. Thanx everyone for making this an everlasting memory. Hope you had a great couple of hours, we certainly did! See y’all next time!!! SAV Entertainment, a company that was responsible e.g. for organizing two Russian Roxette shows in 2010, has just announced that Roxette is due to perform in Moscow on December 1st this year. 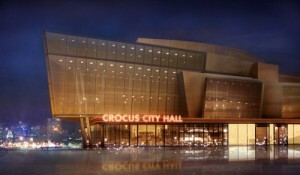 The concert will take place in Crocus City Hall, a multipurpose two-level concert hall that can accommodate over 6,000 people. It is said to be the closing show for this year’s tour. Note: we’ve heard more than once hints that the tour should go on in 2012. Of course, no details are available, so we base these speculations on some statements done by Per and Marie, like that the tour lasts one year, that Per mentioned Halmstad may be in the plan “next year”. And, of course, that they might play in the USA. So far we have a lot of material for each concert so we will keep on adding an article per concert. Same as in Ekaterinburg but “Way Out” was replaced by “Watercolours In The Rain”. Still no “Silver Blue”. In one of the videos posted by Per Gessle we can see Christoffer Lundquist reading the lyrics of Stars. Will the song be played later on? This song was already performed live during the Room Service tour in 2001 in a very nice and different version than the one in the album. Here taken from the showcase in Barcelona. We need your help. The whole world tour will be covered with such topics. If you find something connected with this particular part of the tour, post it in the comment section and we will add it to the article. Thanks for your help and cooperation! Same as Kazan excluding Watercolours In The Rain and Silver Blue. Thanks Evgeny for the information. As Evgeny Perekopskiy posted on his Facebook account today, Roxette – including the band with Clarence Öfwerman, Christoffer Lundquist, Pelle Alsing and Magnus Börjeson – have been in Moscow during the last days. They arrived on December 9th in the evening and flew back to Stockholm this morning. So far, nobody knows why they have been there and what they did. So speculations started that Roxette either did a video or photo shoot or came to Moscow for some TV show recording, maybe even some New Year’s Eve show. Just got home from a couple of dayz (and nights) in jolly Moscow. Great TV-show, superb crowd. Hey you Russian ppl, see ya again in March! By Devilla: Listen to your heart, Wish I could fly and more! Thanx for two unforgettable shows in Russia. We had the time of our lives. Spasiba. Their songs are natural, like air, for now three generations of Russians. I’ve never seen such an unanimous warm welcome to foreign artists by the metropolitan audience. The journey into joy succeeded! – Roxette aims to tour in Europe, South America and Canada. – They already recorded a dozen tracks and should be finished in a few weeks. – Per thinks Marie recovered so well not least thanks to the love for music and desire to sing. In advance of Roxette’s 2 upcoming concerts in Russia, TRUD did an interview with Per. He speaks about the comeback, the new album, Roxette’s breakthrough and the future of the music business. Most of the work is actually done. This is a very strong album. Some very, very good ballad for Marie and a few fast songs. We want to sing much together. To avoid: this song Marie, and this song Per. Just like in our early songs like «Paint», «Dressed For Success» or «The Look», where we sing together. Read the article in Russian or a Google translation!